Friends of Music in partnership with iGrandiTenori and Jazz Expression will present Durban Opera Potpourri on April 14, 2019. With the aim “Let’s Bring Opera Back To Our City”, the concert will feature 12 of the best operatic voices in KZN led by internationally-based stars, baritone Luthando Qave (Sweden) and tenor Owen Boikhutso Metsileng (Germany). Metsileng has been selected to represent Africa in this year’s BBC Cardiff Singer of the World competition which is taking place in June. Included in the programme will be excepts from I Puritani, Tosca, La Favorita, Otello, Uqomisa Iliba, La Bohème, Lucia di Lammermoor, Il Trovatore, Simon Boccanegra and Forza del Destino, to name a few. “When we said it's a "Potpourri" we meant it! Part of our focus is to eradicate the perceived line between different genres of music. For this reason we bring you internationally-acclaimed jazz master Melvin Peters and his quartet to join the mix,” say the organisers. The Durban Jewish Centre will be set up with tables for this event and audience members are encouraged to bring their picnic meals with them. A full bar will be available. The doors will open at 12h30 for audience to enjoy a wine tasting, art exhibition and some jazz music in the foyer, before making their way into the hall for their picnic lunch. 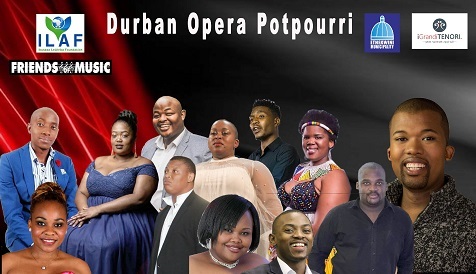 Durban Opera Potpourri takes place on April 14 at 14h00. Tickets R100 (R60 students with card and R30 school children) available at the door or email friendsofmusic@webmail.co.za for pre-bookings.